The RHP75T2NAX is an IP Network Ready rugged dome model from Videolarm designed with a vandal-resistant housing for industrial and commercial use. 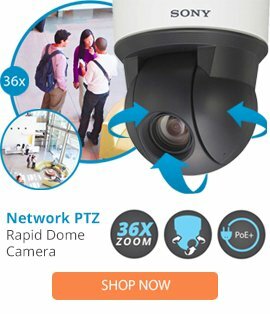 The RHP75T2NAX rugged dome housing comes with a durable polycarbonate tinted lower dome, a 1½” pipe thread pendant mount, one PTZ or fixed MCL 7.5” camera support, plus a thermostatically controlled heater with surge protection, and a strong cast aluminium top. The RHP75T2NAX outdoor dome housing also features a wireless option, a heater/blower, an IP Network camera system universal mounting plate, as well as a .125” cast aluminium top, and an optional cold weather kit for extreme temperatures. This high quality IP Network Ready dome housing has 2 blowers and 2 heaters for standard outdoor use, and is able to handle -40 to +120 degree Fahrenheit temperatures, making it ideal for many different locations where there are concerns with vandalism or weather problems.